John Scott Bowen is a pretty famous personality among sound designers. Above all, he is also a musician. His profession is often claimed to be “sound engineer”, but this isn’t true completely. He is a sound designer – he didn’t just work with someone else’s sound, he created his own sound. 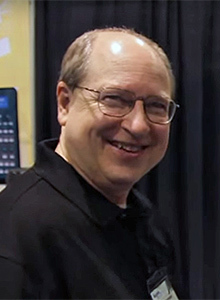 John Bowen started as Moog Music’s first official clinician in 1973. He started to work on Robert Moog’s projects, contributing to the improvement of product quality. In 1976 Bowen met Dave Smith and started the promotion of his model “800 Sequencer”. Then he helped Dave with the specifications of “700 Programmer”. The union of two strong minds led to the development of “Prophet 5”. In this project, John was responsible for 40 factory programs. Later, Bowen began to rule the entire line of Sequential Circuits Products. As a great specialist of what he does, he created 99% of all sounds and sequences, and the majority of original waveforms to make Prophet iconic. John worked with the user interface of Prophet 10, Prophet 600, Prophet T8, Prophet VS, Drumtraks, SixTrak, MultiTrak, TOM, Max Studio 440, Prophet 2000 and 3000 Libraries. Along with this, John played bass and keyboards in the band of Reed Nielsen and Mark Pearson – Nielsen Pearson Band (1974-1980), having recorded three albums together. They were put in the same category with Richard Page and Steve George (Pages, Mr Mister). The albums “Nielsen Pearson” and “Blind Luck” were even released on one CD by the label “Vivid Sound Corporation, Japan”. They started in 1978 with the release of the West coast country album “Nielsen Pearson Band”. To work on the next studio release in 1980, Peter Wolf, Richard Landis, Tom Scott and David Foster joined in. As a result, the song “Annie” became a hit. Among the most unforgettable albums of the early 80’s there was their third album featuring Steve Lukather, Michael Landau, Carlos Vega, Neil Stubenhaus, Robbie Buchanan, Lenny Castro, Joe Chemay, and others. After that, they parted. John helped Billy Cobham create Moog Modular 55 for various recording sessions, one of which was Stanley Clark’s song “School Days”. He also took part in several other projects, especially with Herbie Hancock for the release of Eddie Henderson’s Mahal (Capitol, 1978). In 1987, “Sequential” was bought by Yamaha. After a brief stay under the Japanese roof of “Yamaha”, the team “Sequential” moved to “Korg”, where John became the product manager of the “Wavestation” series and worked here in 1989-1992. After long exhausting three years of collaboration with Japanese business associates, in 1993 John became part of the original OASYS Keyboard Project. The first public presentation of the keyboard culminated at the NAMM show and Musikmesse in 1996. After the cancellation of the project in September of the same year, John took part in the work on “Korg Z1 Voicing”. A year later, having decided to give up on “Korg”, John got into the Japanese chambers of “Yamaha” again in order to resurrect the entertainment technologies of “OASYS Technology” as a designer of UI interface in Oasys PCI synthesizers and effects. In August 1998, Bowen joined the German company Creamware to develop a modular system used in Pulsar/Scope, as well as to assist in their other synthesizer projects. As Bowen said, leaving “Korg” for a hardly known project in Germany which just got started, was rather risky. He had to figure out the Scope development kit within three weeks, replacing familiar to John “Mac” with the new leading computer technologies of the Windows 95 and Windows 98 operating systems, plus to this Windows was in German language (! ), and assemble several working and tested Modules for Pulsar/Scope systems. He did it, but the cooperation did not last long… and then Bowen opted for founding his own business. Since the autumn of 1999, as an independent designer he has created more than a dozen synth plug-ins for Pulsar/Scope on the DSP platform, which are known for their ease of use and sound quality. In November Bowen announced his own synthesizer company “Zarg Music”. The next year by June he had already developed and put into production a set of four software synthesizers for Scope. Thanks to the experience with the Scope platform, his first “Orion” plug-in appeared under his own brand. “Dark Star” was already a little more complicated and had 4 separate filter sections. The unpretentious “Comb Plus” was followed by “Ambient”, while working on which John found another criterion distinguishing large manufacturers from independent designers: whereas for the first one the priority was about marketing and, for example, a bigger polyphony, small entrepreneurs had complete freedom in functional refinement, and this understanding largely predetermined Bowen’s further engineering intentions. A real breakthrough in John’s career was the concept of “Red Dwarf”. Failing and succeeding, he received a schema, the configuration of which was determined by the user. In order to simplify the control panel he chose a modular approach. “Red Dwarf” was largely based on the rejected in “Creamware” designs made by Bowen and on his “Comb Plus Pro”, “Orion” and “Ambient.” Thus, Scope developers saw John Bowen’s invention as a “Zarg Music” plug-in only at the Frankfurt Messe exhibition. At Musikmesse 2007 Bowen presented to the world his multifunctional synthesizer Solaris and released it in collaboration with Sonic Core. Solaris embraced all the skills and experience of Bowen, becoming the embodiment of the “unbearable” modular system. In Sequential, John paid much attention to optimizing the user interface, which contributed to his intention not to confuse a beginner when he gets acquainted with his product. Completely based on the operation of a digital signal processor, Solaris generates a remarkably plausible analog stream. Each of the 4 oscillators turns into one of 6 types, revealing not only the unique ability to pretend to be a Minimoog, Prophet VS, Prophet 5 or one of the Waldorf wavetable synthesizers, but also the ability to produce sound with all of them simultaneously, preferring this or that combination of oscillators and their modes. A similar focus is done with filters: each of 4 ones will play one of 6 roles in any composition (taken from Sequential, Moog and Oberheim). The peculiar sound of the machine is created using vector mixers, rotors, impressive range of modulation and a custom order of effects. Solaris is one of a dozen mega-synthesizers within its range of compact devices, which has no alternatives and will never have, is a dream of collectors and professional musicians of the classical American school. It is still being released in limited batches and you can preorder. Besides, John can add to his terminology list “multitimbrality”, but anyway he believes that his greatest contribution to the world is his sons.